Ha! Ha! With some amount of dilerious laughter I am happy to report that I finally finished Daniel Deronda which was the choice book for the August edition of the Reading to Know Book Club. Am I so glad to have read it? Oh yes. Absolutely. It was an incredibly gripping and entertaining read which I enjoyed very much. I can only highly recommend the read to you! My one and only regret is a silly one and that is that it was so consuming (and so long) that I didn't get much else read (and my TBR stack is glaring at me, mercilessly). Heather has already told us what the book is about so I'll refrain from repeating the storyline here. Instead I'll stick to sharing my impressions. One person asked me how long it took to "get into" the story. Surprisingly (even to myself) it took just the first paragraph to get into the book. I've noticed recently that most modern novels sound the same in their opening paragraph. I can't explain it, except to say that I feel like every modern author is striving too hard to be clever. So much so that most of the time these authors aren't. There is a similar tone and style in modern books. 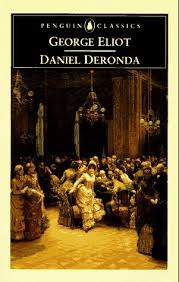 When I initially sat down with Daniel Deronda I felt like I was in for a treat because it read off as being different than most of the books picked up off of bookstore shelves these days. As I read along, I also noticed that the story does not allow the reader to skim. Eliot builds her story slowly, and she throws facts and information that you need to piece things together into random paragraphs. This also made me realize how predictable and easy it is to read the modern novel. Modern authors write in such a way as to allow the reader to skim for basic information; you can skim and miss nothing. I wasn't sure how I felt about having to exert so much energy over this story, but in the end I found myself an even more satisfied reader for having to work for my entertainment. I do not mean to say that Daniel Deronda is difficult to comprehend and follow along with. It's actually very easy to track with, you just have to pay attention. In other words, this isn't a "lazy read." My favorite character in the book was Gwendolyn which is also something of a surprise to me (and probably, too, if you know me!). Despite the fact that Gwendolyn was a snobby brat, she had the most fire in her which always left me wondering what she would say or do next. To be sure, she is not a boring woman! (A stupid one? Yes. But not boring.) I liked her interactions with everyone, with the exception of Daniel Deronda himself. I actually didn't care for him very much at all. I found him to be too perfect and very predictable. The way that Gwendolyn came to rely on Deronda for advice and emotional support in the end was rather grotesque to me. I was totally turned off by Gwendolyn's weakness in throwing herself at Deronda in hopes that he would somehow rescue her from her troubles. She lost all sense of pride by the end of the book. On the whole, I much preferred the beginning of the story to the end. As I say, on the whole I really liked Daniel Deronda . I was never bored in the reading of it. I found it fulfilling and satisfying and I'm glad that Heather picked it! I've never read an Eliot but I will plan to read one again some day! I've never read the book (did see the movie ages ago)... but it sounds like something I would enjoy! I like books that make me work for my entertainment - I certainly agree with your assessment of many modern books. I am glad to hear that I am not the only one who some times runs a little behind! :) I may have to read this one instead of Middlemarch. Do you have an opinion on that one? I am kind of afraid of it and have been putting it off for some time now. Well, we are opposites in the respect that I didn't care for Gwendolen at all - I thought she was way too self-absorbed, even though she did have more personality than anyone else. And I liked Daniel a lot. I guess I saw his struggles as having come before the current situation, when he found out he was illegitimate, what that meant, the pain and shame of it as well as thinking Sir Hugo is his father without claiming Daniel as his son, wondering where his mother is and why she left, etc. I could identify with the pain of that even though that has not been my experience. If a character is good with no struggles, I find them kind of one-dimensional, but when I can see the circumstances that worked to make them that way, that adds depth, to me. I was thinking he was kind of like Moses - raised in privilege away from his people and then turning back to them to help them -- and then someone in the book, Mordecai, I think, compares him to Moses. I also thought Gwendolen was a lot like Daniel's mother. They both say they can't love other people, and Daniel's mother is kind of the ultimate in selfishly living life the way she wants without regard to anyone else. I think Gwendolen would have gone that way without intervening circumstances breaking her. In that regard she is probably the more interesting character, but I can't say I ever really liked her. Then when Daniel announces he is marrying and going to the East, and therefore they won't have the same relationship, it seems that is when she becomes a whole, complete person able to stand on her own. If she and Daniel had become a couple, I don't think she would have developed, as she was too dependent on him. Anyway, it was a fascinating read, and, like you said, not a hard one, particularly, but not a lazy one. I'm engaging in some lighter fare now, after a bit of heavy reading, but want to read another of Eliot's books some time. Whoa! I'm surprised and glad you liked Gwendolyn. She is, in my opinion, the best character George Eliot ever created. Quite possibly the most interesting character of her time. The comments here about Gwendolyn make me want to read this even more! Some day. . . I will say that I loved Gwendolyn as a character, but would never, EVER want to marry her. I too found Daniel to be a bit too good, but I did identify somewhat with his internal struggles. So, less annoying than a Dickens female, but not as interesting as Gwendolyn. I wanted to spend some time exploring the anti-Semitism angle, but I ran out of time and space, and decided it probably needed its own blog post. Too much to unpack in this review. I haven't read Middlemarch (yet), but my wife really liked it, so I assume it would be an equally good choice.